Delhi Metro provides wonderful opportunities for discovering Delhi and to visit its rich trove of historical monuments. 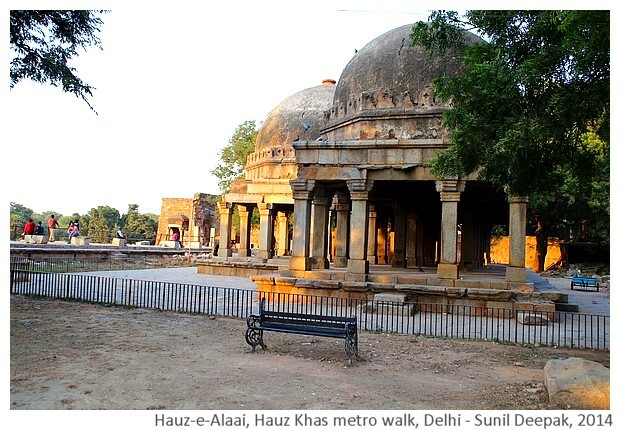 This post is about discovering the Delhi of the 13th - 15th century through a walking tour from the Hauz Khas metro station. Chor Minaar or the "Tower of thieves" in the image above can give you an idea of the historical riches awaiting you on this walk. 13th to 15th centuries in Delhi are known as the "sultanat" period. In this period, Delhi was under different dynasties of Turkish origins. This period continued till mid 1500s, when Hamayun arrived in Delhi and gave rise to the Mughal dynasty. 13th century saw the arrival of Slave (Mamluk) dynasty in Delhi. They made their city in Mehrauli area of the present day Delhi. Sultan Qutubuddin Aibak from the Mamluk dynasty built the well known Delhi landmark Qutub Minar. Near the end of 13th century, the Mamluks were replaced by the Khilji dynasty. 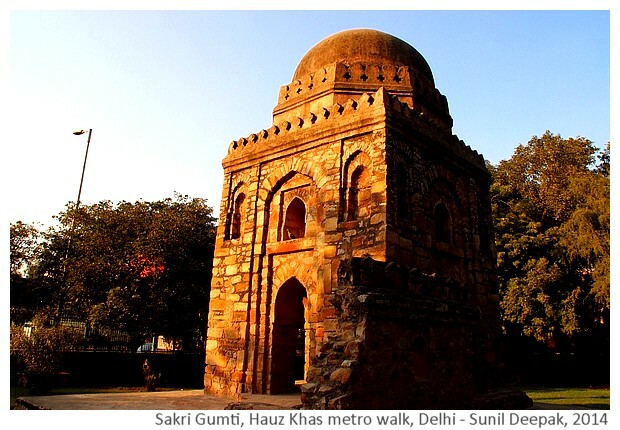 Sultan Alauddin Khilji, who became Delhi's ruler in 1296 AD, named his city Siri and moved it to the present day "Siri fort" area near Hauz Khas. He also constructed a a water reservoir for his city that was called Hauz-e-Alai and gave the name to Hauz Khas (King's water reservoir). Khiljis were replaced by the Tughlaks in the early 14th century. Initially Tughlaks tried to shift their capital from Delhi to Daulatabad in Maharashtra, but it did not work out and they returned to Delhi. 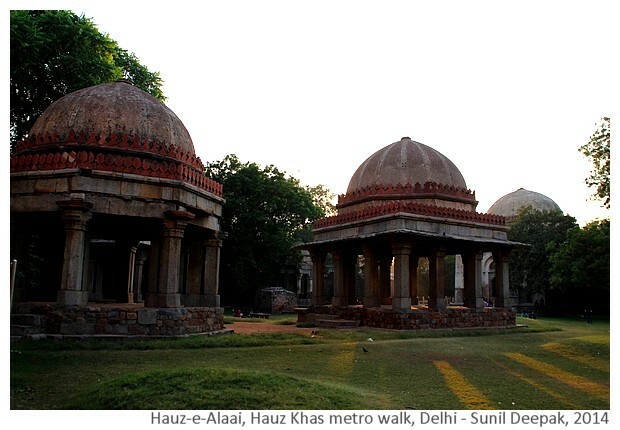 Their Delhi was then shifted to Tughlakabad to the south of Hauz Khas. 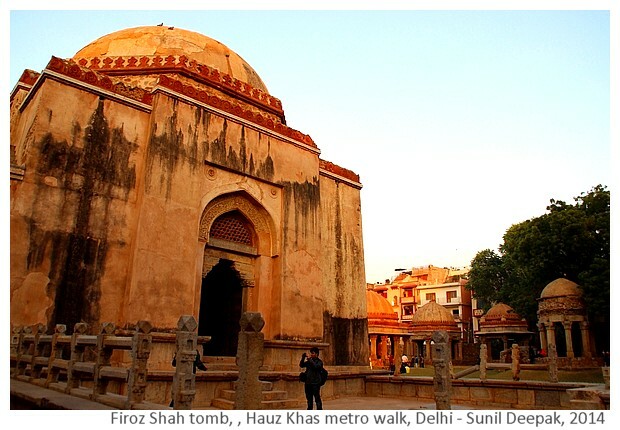 One of the Tughlak kings, Firoz Shah, is buried in Hauz Khas (his tomb in the image below). In the second half of 14th century, the Tughlaks were replaced by the Lodhi dynasty and their Delhi moved towards the north. 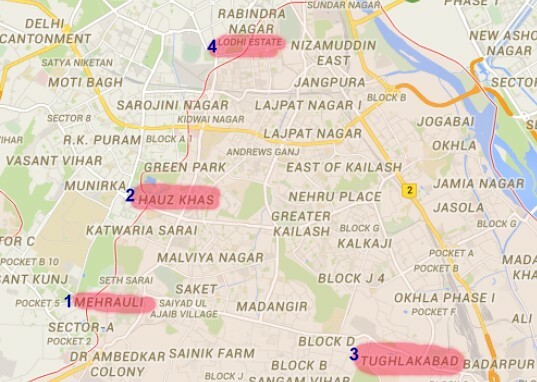 The Delhi map in the image below, shows these shifts of the power centres in Delhi during 13th to 15th centuries - first to (1) Mehrauli, then to (2) Hauz Khas, (3) Tughlakabad and finally towards (4) Lodhi Gardens. This whole area is full of historical buildings, especially tombs, mosques and madarsas (Islamic schools) from that period. 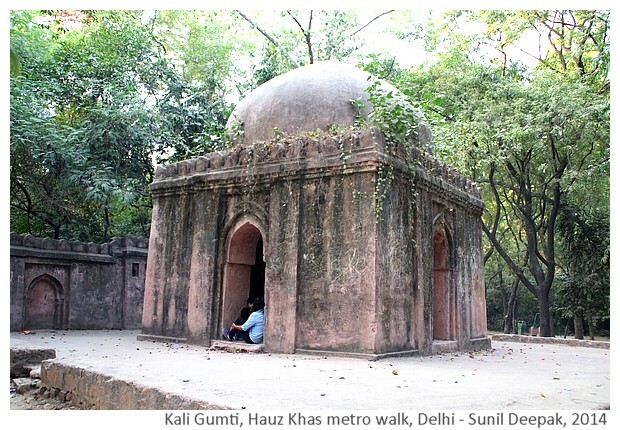 The Hauz Khas metro walk is an opportunity to discover some of those forgotten buildings. With the arrival of the Mughals, Delhi was shifted further to the north-east - first to the old fort and then towards Red Fort. Thus, gradually the Delhi of 13th to 15th centuries was abandoned and the Aravalli forests covered many of these buildings. Most of them have been rediscovered and repaired over the past 2 decades. With this brief introduction to the city's history, now we are ready to start our walk. Hauz Khas stop is on the yellow line of Delhi Metro connecting Jahangir Puri and Kashmiri Gate in the north to Rajiv Chowk in the centre and to Huda City centre in Gurgaon towards the south of Delhi. 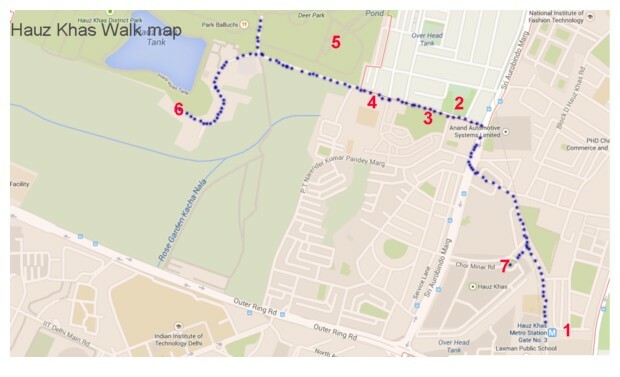 For this walk, take exit 3 from the metro station, that goes towards the College of Home Economics and Mayfair gardens. As you come out of exit 3, continue along the same road and follow it as it joins Sri Aurobindo Marg. Cross to the other side and continue in the same direction. You will pass in front of the Aurobindo market. 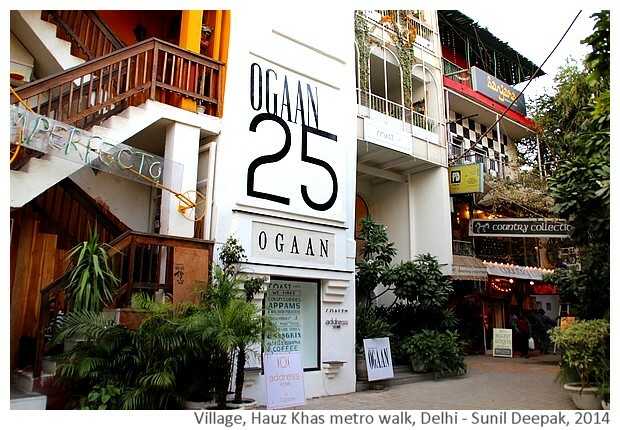 After the market, turn left on the Hauz Khas village road towards the Deer Park. The total walking distance is around 3 km and if that is too much for you, you can take an auto for this part. The different places to see on this walking tour are marked on the map below. Exit 3 of Hauz Khas metro station is marked as 1 on this map. For a better view, look at this area on the Google map. 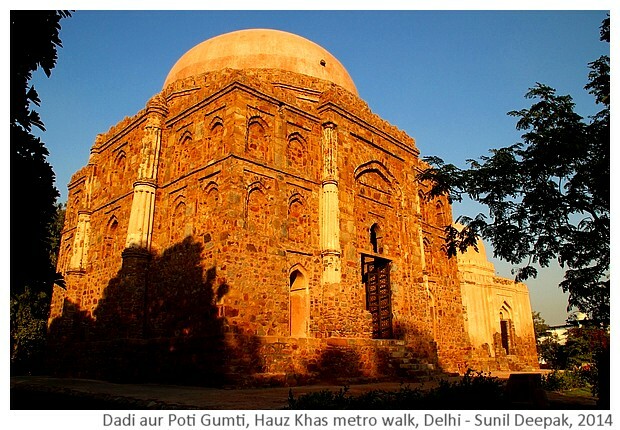 A short walk on the Hauz Khas village road brings you to the Dadi (Grand mother) and Poti (Grand daughter) tombs on the right side, enclosed inside a tiny garden. The names of the tombs are misleading - they are just a way to denote a bigger and a smaller tomb. The smaller tomb (Poti tomb), has a distinctive lantern on its top and is from the Tughlaq period (14th century). The bigger tomb (Dadi tomb) is from a later (15th century) Lodhi period. A little further down the road, on the left side is a building called Barah Khambe (12 columns), a harmonious looking square building with 12 columns of varying widths. It has different tombs inside and outside, and has some other constructions including a curious bastion like structure. This building also dates from Lodhi period (15th century). Just across the road from Barah Khambe is the Sakri Gumti (Narrow building), also from 15th century. A few meters down the road is Chhoti Gumti (Small building) with a small park, very popular with local families, who come and sit here in the evenings. All these buildings are from the Lodhi period and were probably tombs of important persons of that time. A little walk brings you to the white coloured Jagganath temple on the left side of the road. Lord Jagganath, representing Krishna, is a deity from Odisha state of India, that has the famous ancient Jagganath temple at Puri. The massive chariot of Lord Juggenath in Puri has given rise to the word "juggernaut". The temple on Hauz Khas village road is a recent construction that makes for a nice stop for its intricate workmanship and the colourful lions at its entrance. 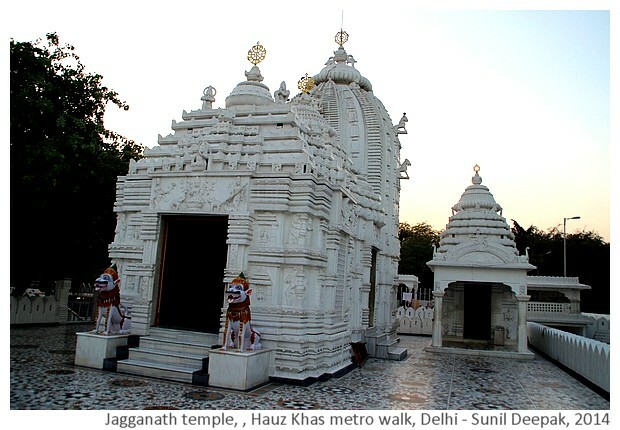 A short walk from Jagganath temple brings you to the entrances of Hauz Khas village and the Deer Park. The Deer Park has an enclosure for the deer and another one for rabbits. Parts of the park are covered with a dense forest. The deer are protected by different layers of metal nets and barbed wires, probably denoting difficulties in controlling the behaviour of the crowds visiting this park. Because of these big and ugly barriers, personally I did not like this part of the park. However, the park also has different historical buildings, such as the walled mosque and Kali Gumti (Black building) in the image below. 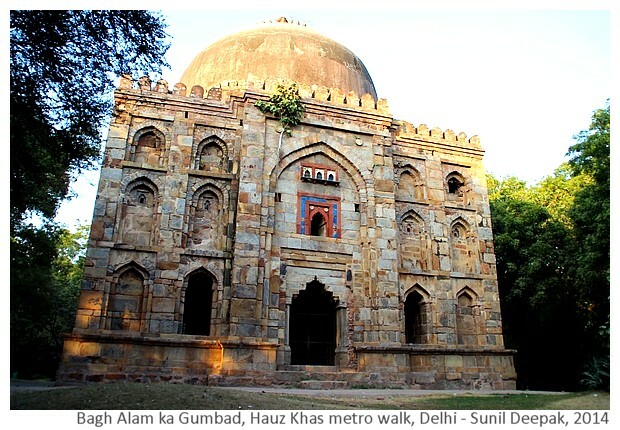 One of the most beautiful buildings in this area, "Bagh-i-Aalam ka Gumbad" (The dome of the garden's king) from the 15th century Lodhi period is also in the Deer park. 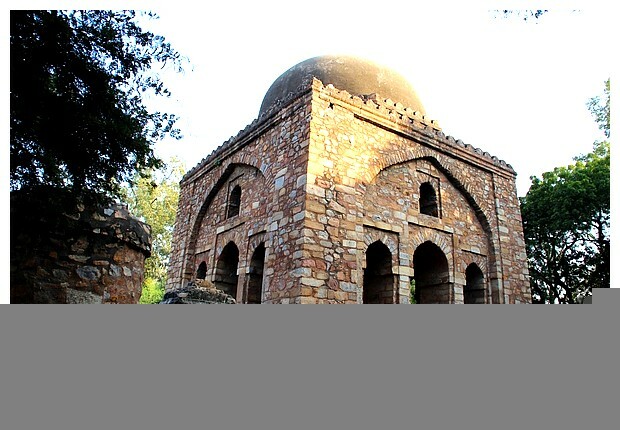 It is very similar to the better known tombs in the Lodhi Gardens. Decorated with blue and dark red stones, it is a little jewel of a building. 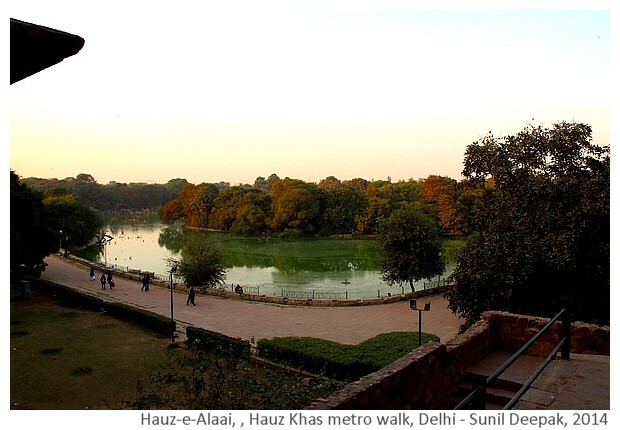 After the visit in the Deer Park, you can continue your journey in the "Hauz Khas village", an area full of chic shops, art galleries and restaurants, that used to be a village till 1980s. If you are interested in cuisines from different parts of the world including Italian espresso coffee, French patisserie and the Persian kebabs, you will find them all here. 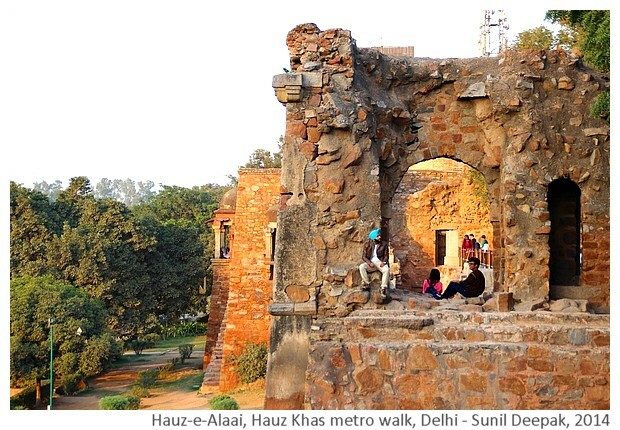 A short walk through the main road of the Hauz Khas village, will bring you to the numerous ruins around the water reservoir built by sultan Khilji in the 13th century. There are different buildings here including the ruins of a madrasa (Islamic school), a three-domed building used for meetings, different chhattris (stone umbrellas) and mosques, from different periods between 13th to 15th centuries. There is no entry ticket to visit these ruins. While you walk around the ruins, below you can also admire the old water reservoir at a lower level. It was restored a few years ago with paths for walking. The way to the reservoir walking path is through the Deer park. 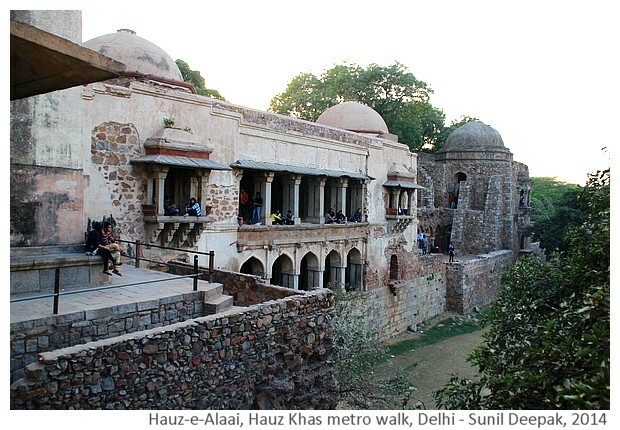 The Hauz Khas ruins also include the tomb of the king Firoz Shah Tughlak mentioned above. These ruins are a popular meeting place for students and young persons, who sit around the different buildings - reading, daydreaming, gossiping or playing. They also give a wonderful lived-in alive air to the ruins. 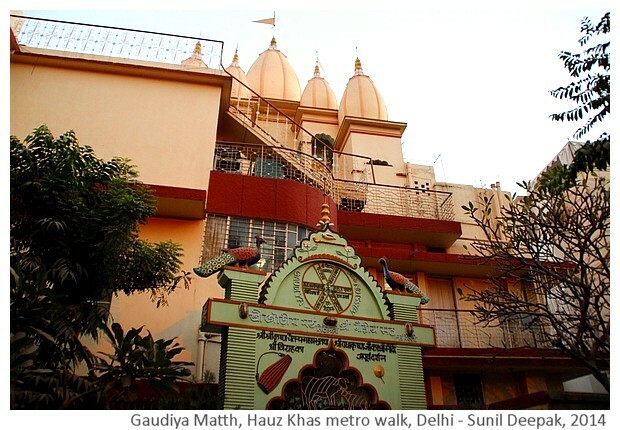 If you are not tired from the walk, on your way back to the gate 3 of the Hauz Khas metro station, you can visit a small side lane which has a Hare Krishna temple called Gadiya Matth (monks' house) and the Chor Minaar (Tower of the thieves). Chor Minaar was a police tower on an ancient 14th century Delhi road, and was used as a look-out for thieves and bandits. Like Chor Minaar, there are many other buildings from this period of Delhi's history in this area, hidden behind houses in the residential colonies, or closed inside traffic round abouts. For example, across Ring Road and Sarvapriya Vihaar, you can take Maharishi Dayanad Marg and then follow on the right side to Geetanjali Marg, where you can take a look at the 14th century Begumpuri mosque. For most of these buildings, it is not easy to find information about specific buildings such as who was buried there or what was their historical importance. 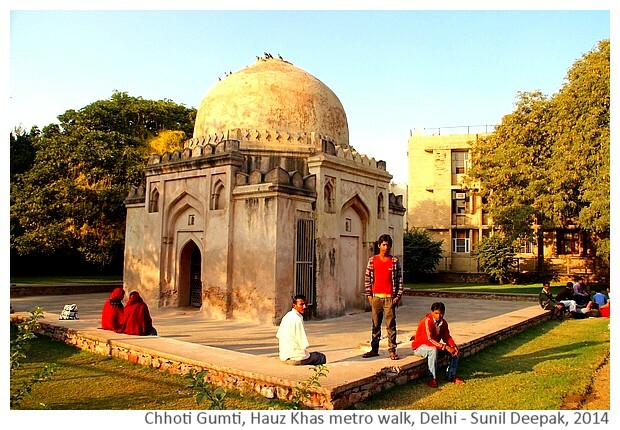 The Delhi chapter of INTACH, a citizens' organisation, has done pioneering work in promoting the conservation of numerous heritage buildings in the city including the Hauz Khas complex. If you are interested in learning more about these buildings, you can take a look at the INTACH publications "Delhi - The built heritage" and "Delhi - A thousand years of building". 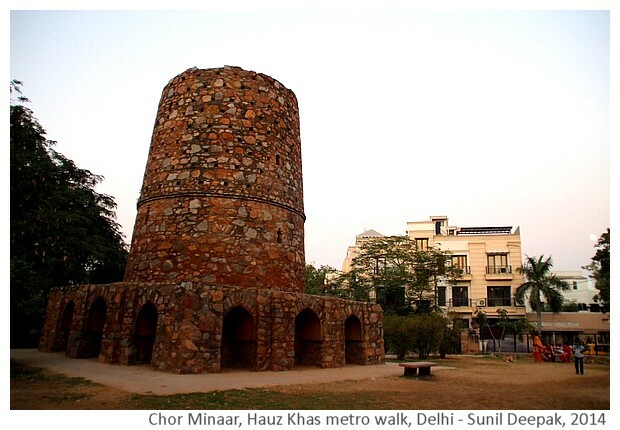 Finally if you do not mind missing on the Chor Minaar, you can also reach Hauz Khas village road from the Green Park metro station! Yes, Hauz Khas vilaage is a really cool place. In my last 8 months of stay in Delhi, I have been there for about 5-6 times and I love that place. Very Nice post. Beautiful pictures. Welcome to Delhi's charming Hauz Khas Village, full of pleasant gardens, quaint little shops, restaurants and cafes, and a cluster of magnificent medieval buildings set around a reservoir. 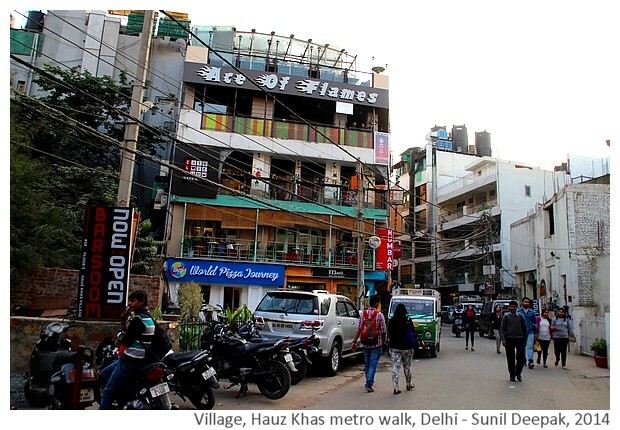 Explore more about Hauz Khas Village entry fees, open timings, visit duration etc.